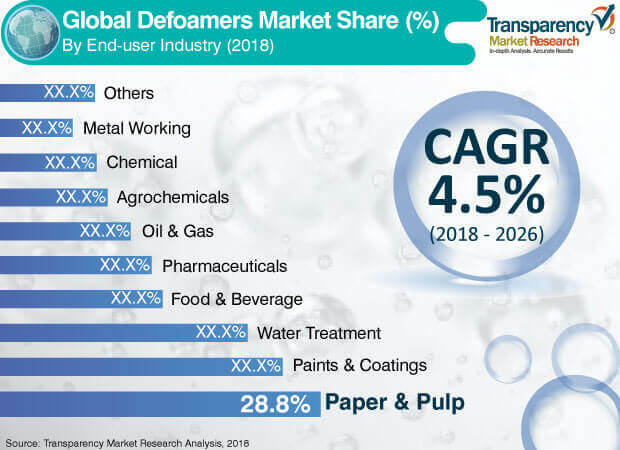 The global defoamers market was valued at around US$ 7,000.0 Mn in 2017 and is anticipated to expand at a CAGR of more than 4.0% from 2018 to 2026, according to a new research report published by Transparency Market Research (TMR) titled ‘Defoamers Market - Global Industry Analysis, Size, Share, Growth, Trends, and Forecast, 2018–2026.’ Rise in demand for defoamers in water treatment and paints & coatings industries drives the global defoamers market. Asia Pacific accounted for a major share of the global defoamers market. In terms of demand, China accounted for a dominant share of the market in the region. The defoamers market in Asia Pacific is projected to expand at a CAGR of around 5.0% during the forecast period. Defoamers play a vital role in pulp and paper mills, as they hamper the formation of foam. They are surface active agents such as esters or amides of fatty acids and PE glycols. Build-up of foam in paper mills can cause various types of issues such as difficulties in the formation of paper, creation of deposits, development of bacteria, and drainage problems. Defoamers improve drainage in kraft pulp stock and sulfite stock in pulp mills. Usage of defoamers leads to the reduction of paper breaking, thus improving the function of the paper machine. Defoamers exhibit lower steam consumption attributes, which helps save energy and costs. These properties are anticipated to drive the defoamers market. Mechanical or chemical defoamers play an important role in industrial manufacturing and processing of liquid paints and coatings. Defoamers are effectively applied with the help of brushes, rollers, or sophisticated application methods such as spray or curtain coating. Implementation of stringent environmental regulations have led to the replacement of solvent-based systems with water-based coating systems. Large amounts of special surfactants are utilized in waterborne coatings. This has led to the need for highly efficient defoamers. Excessive foam formation results in inefficiency; long grinding time; storage instability of paints and coatings formulations; and other issues such as crater formation, loss of adhesion, gloss reduction, and loss of opacity. Silicone-based, silicone-free, oil-based, or wax-based defoamers can be employed in paint & coating applications, depending on their formulations and physical properties. High usage of defoamers in the paints & coatings industry is expected to propel the defoamers market in the near future. Rise in usage of defoamers in the paints & coatings industry due to their exceptional attributes is projected to boost the demand for defoamers during the forecast period. Usage of additives such as defoamers in food and drugs is listed in the Code of Federal Regulations (CFR) under the U.S. Government regulations. Rules established by the Food and Drug Administration are mentioned in Title 21, while Title 40 entails the concerns of the Environmental Protection Agency. These regulations are subject to change and CFR is revised at least once in the calendar year. These regulation have been implemented to curb the usage of defoamers in food and drug applications; however, the regulations differs from one country to another. Therefore, every company must comply with the regulations of a particular country to protect itself from any loss due to alteration in any such regulations. The World Health Organization is taking efforts to establish international guidelines on food additives to standardize regulations across the globe. However, most countries prefer to follow their own guidelines to protect the interest of the consumers. Based on region, the global defoamers market has been segmented into North America, Europe, Asia Pacific, Latin America, and Middle East & Africa. In terms of revenue, Asia Pacific led the global defoamers market in 2017. China accounted for a significant share of the market in the region in 2017 owing to high rate of adoption of defoamers in paper & pulp, paints & coatings, and water treatment industries. In terms of revenue, market share of by Asia Pacific is lower than that in terms of volume. North America and Europe differ in these parameters compared to Asia Pacific. This is due to lower prices of defoamers in Asia Pacific, as compared to those in the other two regions. Asia Pacific is a manufacturing hub of defoamers, accounting for more than 30% of the global production. Availability of raw materials for defoaming agents at low prices is expected to drive the market in the region during the forecast period. Furthermore, prominent players are focusing on expanding their production facilities in Asia Pacific to cater to the surging demand for defoamers from several end-use industries in the region. The defoamers market in North America and Europe is likely to expand at a moderate pace during the forecast period. Key players operating in the global defoamers market are Ashland Global Holdings Inc., BASF SE, Clariant International AG, Dow Corning Corporation, Elkem Silicones, Evonik Industries AG, Momentive Performance Materials Inc., Shin-Etsu Chemical Co., Ltd., and Wacker Chemie AG. The defoamers market is highly fragmented and highly competitive in nature.